Serve hot accompanied by tagliatelle and a well-chilled glass of Vintense Chardonnay. Bon appétit! Chop the vegetables: cut the carrots and courgettes using a mandolin, slice the tomatoes into thin rounds and the pepper and onion into strips. Fry for 3 minutes with a little olive oil (the vegetables must not lose their bite). Prepare 4 sheets of parchment paper. 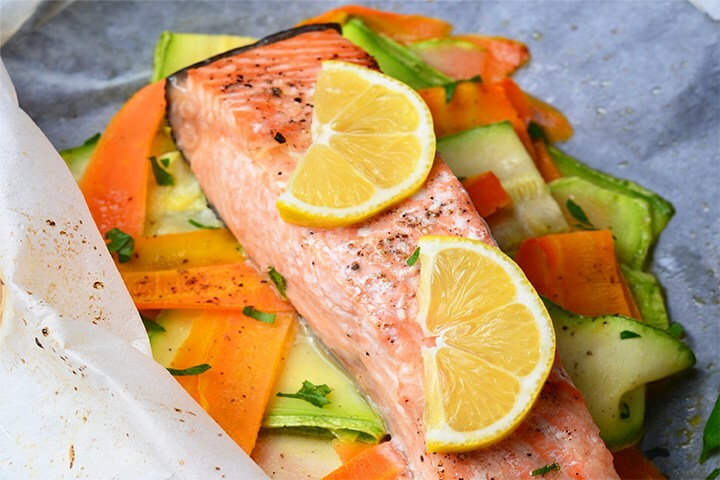 Spread out the vegetables and place your salmon fillets on top. Season with salt and pepper. Add herbs (basil, parsley, etc. ) and a little garlic. Place one or two slices of lemon on the fish. Drizzle with a spoonful of olive oil and a good splash of Vintense Chardonnay. Close the papillotes and cook for 15 to 20 minutes, depending on the thickness of the fish.